This post – another in our series in Jamaica’s art pioneers – was researched and written by Monique Barnett, our new Curatorial Assistant. Monique is a graduae of the Edna Manley College (Painting) and has previously worked with Ardenne High School and the MultiCare Foundation. Parboo felt strongly that art should be functional…the viewer…must somehow be brought into the situation which the artist’s brush described and must find himself reacting to the message of the artist. And Parboo insisted – there must be a message. Karl Parboosingh was born in Highgate, St. Mary to Mr and Mrs Vivian Coy in 1923. He went to high school in Kingston, attending both the Calabar High School and the Wolmer’s School for Boys. In 1942, he left Jamaica to attend the Art Students League in New York. From there, he travelled worldwide, initially as a soldier in the US army during World War II in 1945, then to other international art centres to work and study, namely Rome and Paris (years later he was to name his son after the city). In 1952, he studied in Mexico, under the tutelage of Spanish painter, Jose Guttierez and Mexican muralist, David Alfaro Siquieros – the influence of socialist ideology is evident in some of his major works. Karl met and married his second wife Seya Parboosingh in New York, 1957 and credited himself as being instrumental to her, a creative writer, becoming a painter as well. They settled in Jamaica in 1958. Aside from his canvas works, he is additionally credited with the creation of several murals commissioned by the government and other entities – the social potential of public murals was being explored in Jamaica in the late 1950s and 60s. Such examples can be seen at the Norman Manley Law School at the University of the West Indies Mona Campus, the Church of the Resurrection in Duhaney Park and the Olympia International Art Centre in Papine where he was chosen as the centre’s first artist in residence. There he continued to live and worked until he took ill and died on May 18, 1975. Karl Parboosingh’s work can probably be best described as Jamaican Expressionism. Even still, it would be inadequate to limit him to a strict genre as he was known to toy with and experiment with many techniques and styles of the modernist movement going through various phases. His work is distinguished by heavy and sometimes aggressive application of pigment and an uninhibited use of the colour black whether as an elemental, symbolic or conceptual factor. Young Mothers (1965), features the solid black figures of women and their children, highlighted by garments of soft pink and green. In Dance of the Candles (1966), the bold rhythmic black brushstrokes flicker as shadows in the candlelight. Parboosingh’s subject matter coincided with the Jamaican nationalist movements of the sixties, before and after the year of Jamaica’s independence. He sought to depict the blacks of Jamaica as resilient and dignified in their struggle for advancement. Religion, colour and racial pride were recurrent themes in his work. Jamaican Gothic (1968), was quite likely a parody of the painting American Gothic (1930) by American painter, Grant Wood. Here Parboosingh’s paint application greatly contrasts with its American counterpart in striving to bring forward a view of Jamaican social realism as oppose to a re-iteration of European social ideology. The seated figures, a woman and two children, emerge from a melee of erratic brushstrokes. Their environment unrefined yet reflective of a struggle to survive. Their facial identities are obscured and irrelevant yet their racial identity is poignantly present through the emboldened use of black. The warmth of reds and yellows further support an energetic feel to the composition and context. A similar yet more aggressive palette composes Ras Smoke I (1973). 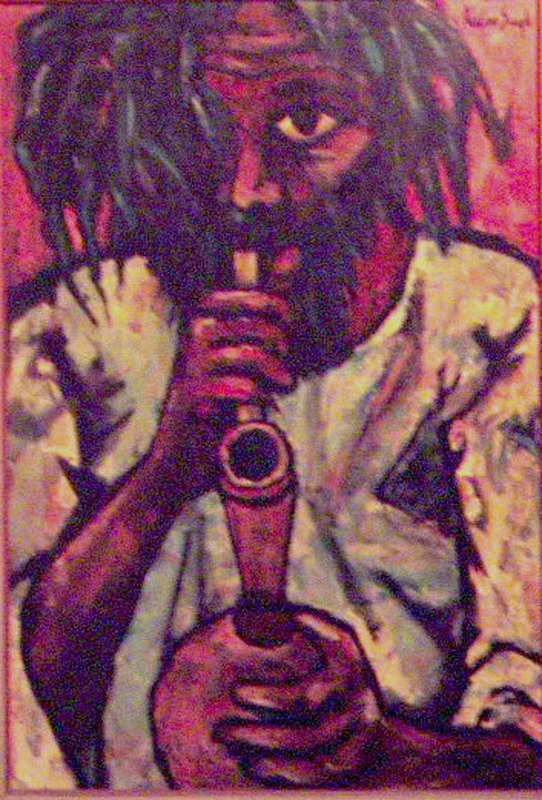 The obstinate stare of the depicted Rastafarian and his pipe implies the defiance of the Rastafarian sub-culture to conventionally accepted colonial norms and ideas. 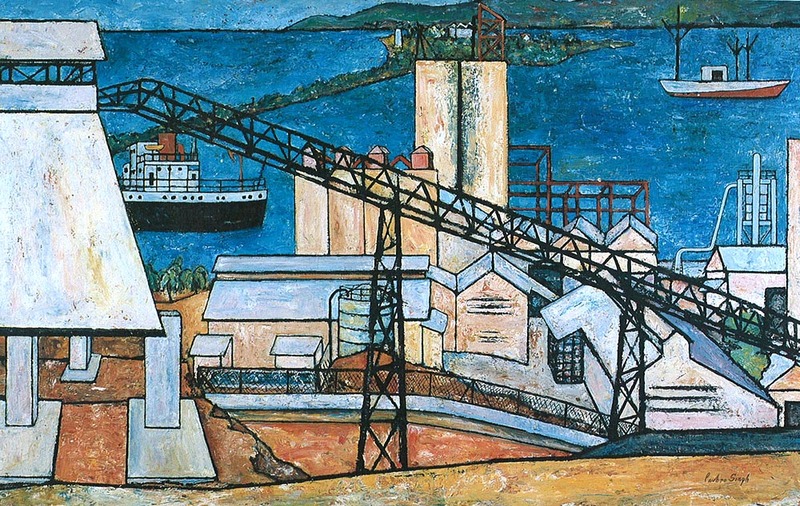 Production as a route to nation building is explored in the painting, Cement Company (1966). Hard outlines and solid rigid shapes characterize the industrial-themed work, dividing the canvas into sections or planes. 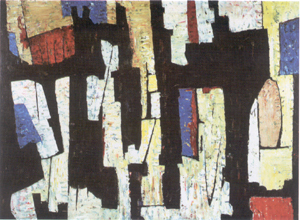 Such a painting could be seen as a precursor to later works of abstraction such as Flight to Egypt (1974) and Industrial Abstraction (c. 1975). In these examples, Parboosingh takes a stylized approach to the use of basic and solid line, shape and colour to communicate subjects and themes, quite different from his previous examples of representation. 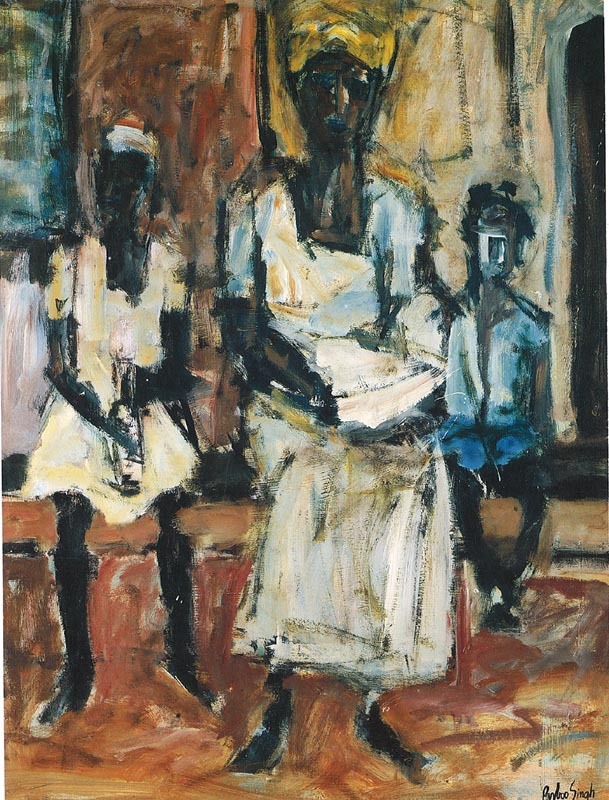 Karl Parboosingh was a founding member of the Contemporary Jamaican Artists Association in 1964, along with Barrington Watson and Eugene Hyde – a group of young artists who built on and challenged the tenets of the nationalist school, while demanding recognition as professional artists. They experimented with aesthetic and conceptual innovations of high modernism and engaged, through their work, with the radical politics of the day. Parboosingh’s fearless and revolutionary perspectives, as observed through his works and in his social interactions, characterize a passionate endeavour to use art as media unlike any other for radical social change and exploration. It is a lesson for future generations of artists who wish to evoke pertinent and relevant social and ideological dialogue in their own works and it is a lesson which has already been used by contemporary artists such as Eric Cadien, Omari Ra and Stanford Watson. ← Edna Manley’s Bogle: A Contest of Icons – Tell Us What You Think! What a very interesting retrospect! Never known too many Jamaican artists but thank you for sharing! Regretfully, valuation information of works of art in our collection is confidential; nor do we provide valuations of other works of art for third parties. Please direct your query to an art valuator, commercial gallery or auction house. Best wishes. Kindly email us at and we will send you a list of art dealers in Jamaica who may be able to assist. DO you know of any galleries I could contact in Jamaica that would be interested in handling a piece we have by Parboosingh? Kindly email us at info@natgalja.org.jm and we will send you a list of dealers and galleries in Jamaica. Hi Jan. Just seen your message regarding the piece by Karl Parbosingh. He was my older brother and I’m trying to find out some things about him. Can I see that picture please. My name is Desmond Coy and I live in London. My e mail is desmondcoy@rocketmail.com. Thank you. As a national art museum we cannot do valuations for third parties and also do not have enough information to authenticate or contextualize this work. We can however send you a list of local art dealers that may be able to assist with a valuation should you wish to do one.